As from today, anyone caught smoking in a private car when accompanied by children under the age of 16, will be liable to a fine of €50. Malta is the sixth country in the European Union to bring in these regulations. This legislative measure protects children and young people from the damaging effects of secondhand smoke. Children are at particular risk from the effects of passive smoking because they have an increased risk of developing chest infections during their first five years. Levels of toxins from smoking in cars can reach high counts very quickly. This new law has found full support in Maltese society including that of the Tobacco Industry Advisory Council. Say goodbye to those slim ‘lipstick’ style cigarettes. Adios to that menthol, fruit or vanilla flavoured tobacco. 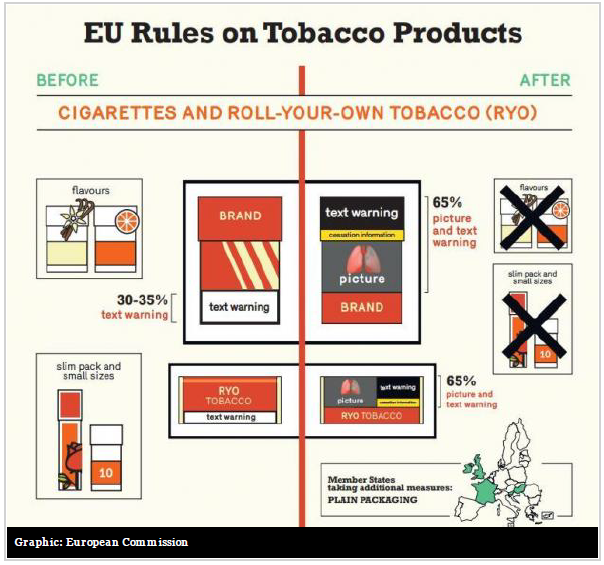 New tobacco regulations that form part of the EU’s Tobacco Products Directive come into force today, and they bring with them significant changes to the manufacturing, sale and presentation of tobacco products. Tobacco products with flavours designed to mask the taste or smell of tobacco are out, although menthol smokers have until 2020 to kick the habit. Health warnings on tobacco products must now cover at least 65 per cent of the front and back packages, and the tar, nicotine and carbon monoxide labels smokers are used to will be replaced with the messages “smoking kills” as well as “Tobacco smoke contains over 70 substances known to cause cancer”. Other tobacco products such as pipe tobacco, cigars, and cigarillos must carry a general warning and an additional text warning. Cigarette packets can contain a minimum of 20 cigarettes, thereby outlawing the 10-packs popular with young people in other EU countries. All tobacco products must also report their ingredients in a standardised electronic format. Electronic cigarettes are also regulated. They can contain nicotine concentrations of no more than 20mg/ml with cartridges no bigger than 2ml. The Commission has also said it will monitor e-cigarettes’ uptake and report back in five years’ time. An estimated 500 people died through causes directly attributable to smoking in Malta between 1999 and 2013. In Malta, the average annual deaths attributable to smoking in males and females between 1999-2013 were estimated to be 396 and 111 deaths respectively. Another concern is the take up of smoking by youths. Research shows that 70 per cent of smokers start before the age of 18 and 94 per cent before the age of 25 years.